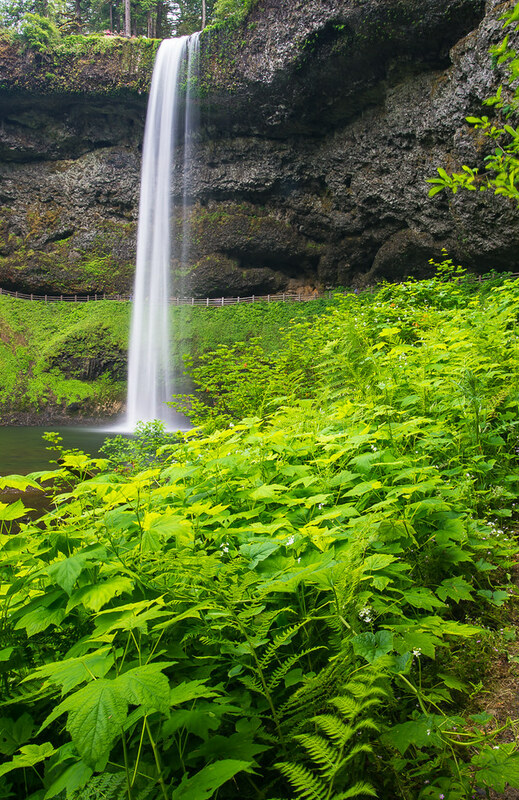 In June 2014, I took a 4-day trip to the Oregon Coast and Crater Lake National Park and stopped at the Silver Falls State Park on the way back home. I covered about 1200 miles as shown in the trip map below. 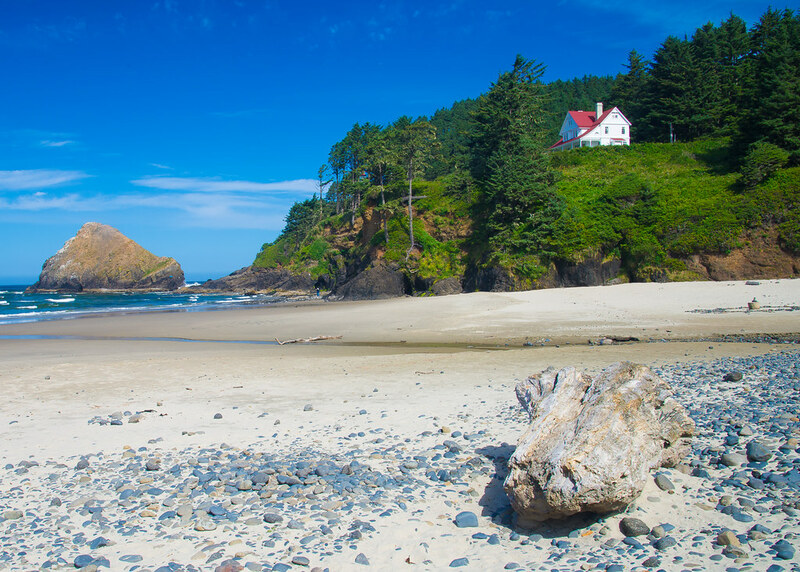 The Oregon Coast is a region of the U.S. state of Oregon that runs north–south along the Pacific Ocean, forming the western border of the state; the region is bounded to the east by the Oregon Coast Range. 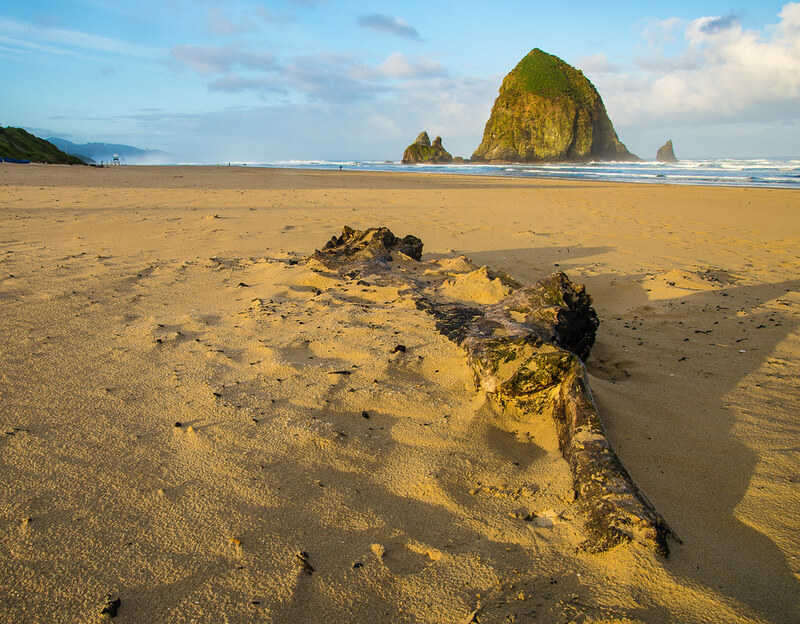 The Oregon Coast stretches approximately 363 miles from the Columbia River in the north to the California state border in the south. The previous night I had checked into a B&B near the Haystack Rock. I got up just before sunrise and headed to the rock. Got a few shots. From Cannon Beach, I started to drive south towards Newport. 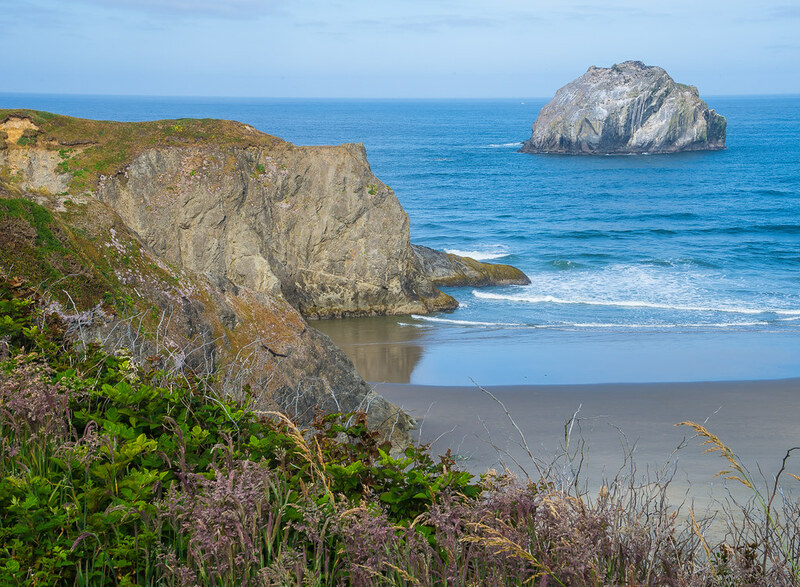 I shot a few images of sea stacks from the road (US 101) near Hug Point and Oswald West State Park, a few miles south of Cannon Beach. The light was already getting rather harsh, a problem photographing in the Pacific Northwest in the summer. 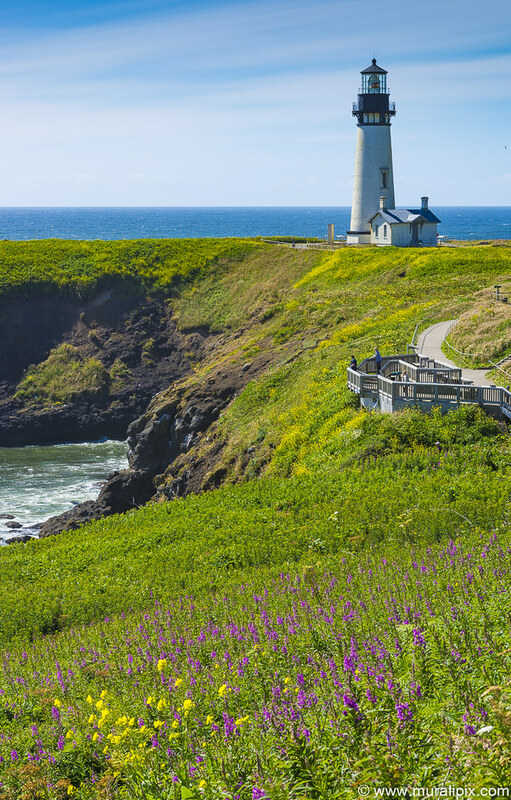 I decided to have a brunch in a roadside restaurant in the town of Nehalem, OR and drove to the Cape Meares Lighthouse, east of Tillamook, OR. Due to its location and approach, I found limited opportunities. Another issue was the light. In the summer, in the Pacific Northwest, the light gets really harsh between about 930am and 4pm. I just shot 2-3 images of the lighthouse. 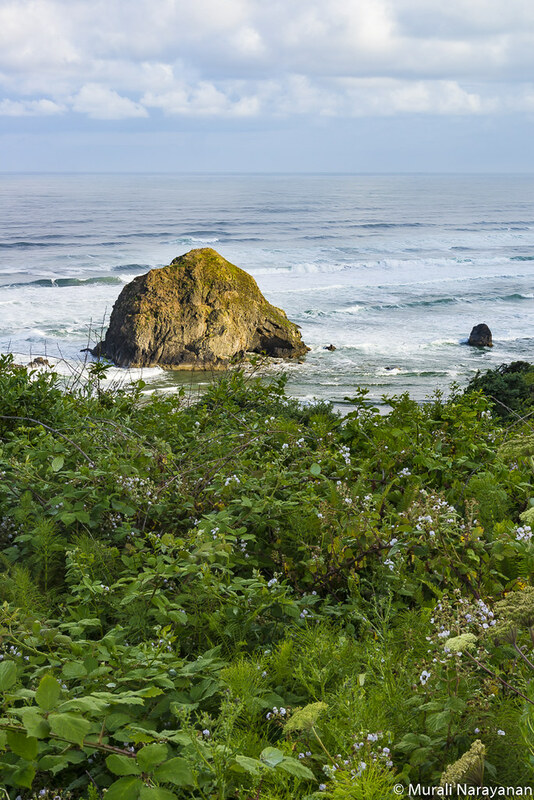 I continued to drive south towards the town of Newport, OR stopping along the way to enjoy the rugged coast scenery. One stop I really liked was at the Rock Creek State Park Scenic Viewpoint. The sea was quite rough and the waves were hitting the rocks along the shore very hard. 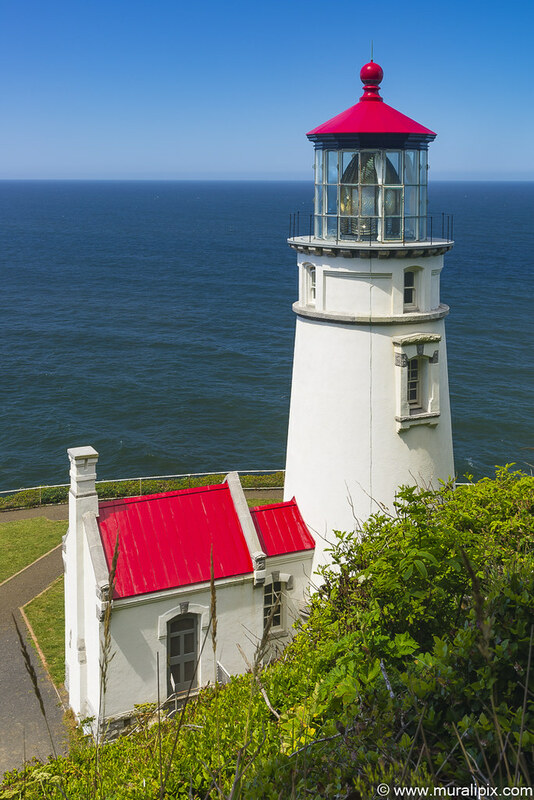 After spending an hour, I reached the stunning Yaquina Head Lighthouse just outside the town of Newport. There are a ton of composition opportunities. It is an awesome spot for sunsets. The only issue is that the park only opens at 8am (10am on weekends) and so in the summer, you have to park your car outside the park and walk a mile carrying your camera equipment if you want to shoot at dawn and/or dusk. Below are the 3 images of the light house shot that afternoon. As the Park closed at 6pm sharp, I could not shoot the lighthouse in the blue hour – for that I need to be back in early spring or in the late fall. It was a foggy morning. 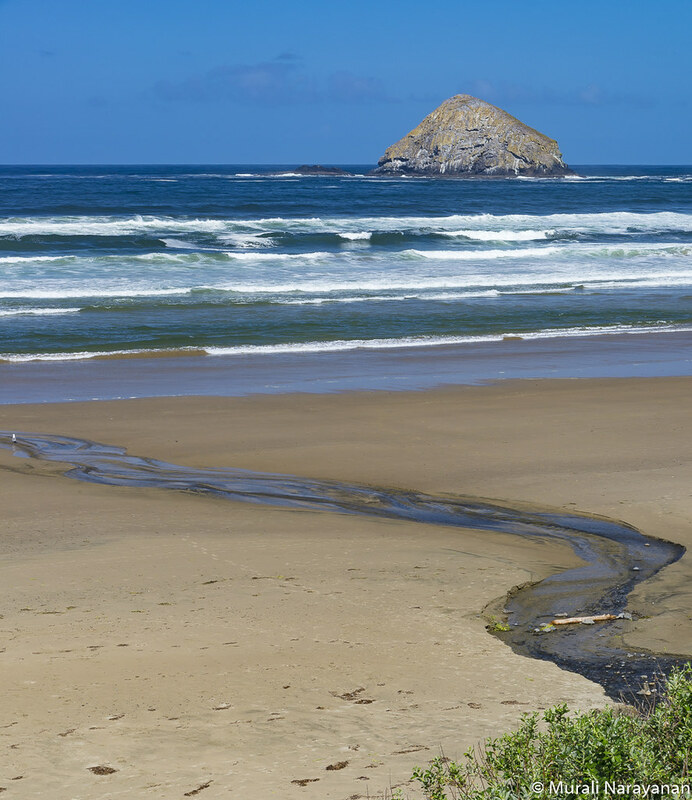 I continued to drive south towards Bandon Beach in Southern Oregon. 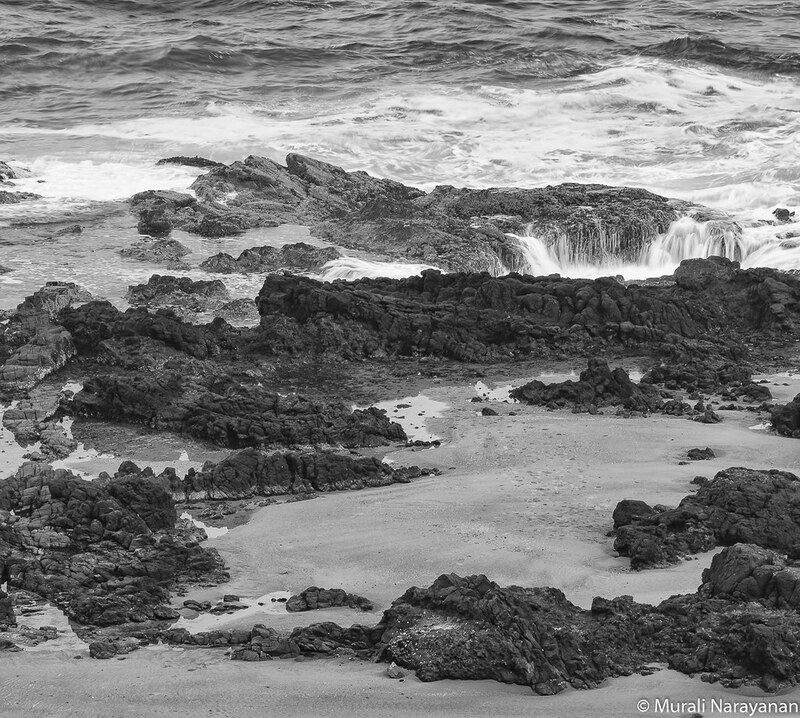 First stop was at Thor’s Well at Cape Perpetua near the town of Yachts. The best time to photograph it is between an hour and an hour after high tide at sunset. It releases jets of water which are pumped into the air via the power of the ocean tide and waves. Here is an image taken at 830am. 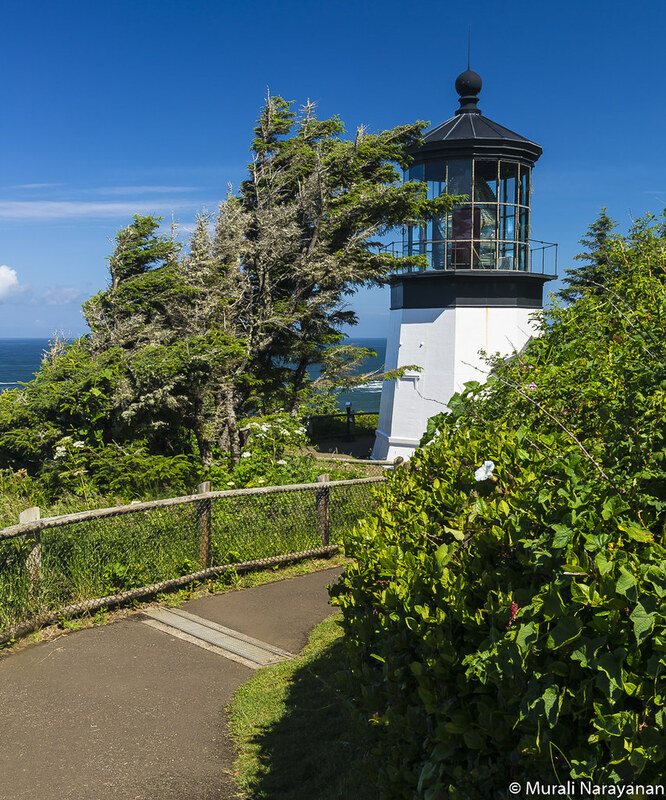 The next stop was at the famous Heceta Head Lighthouse. 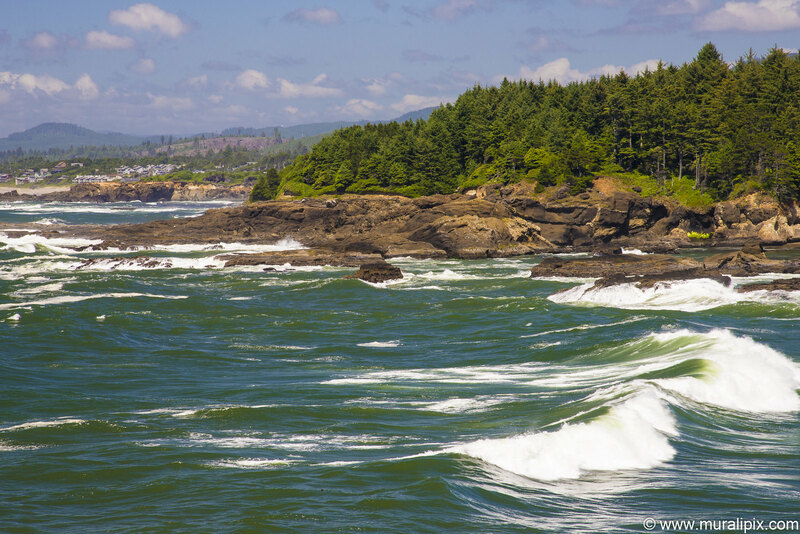 It is located 13 miles north of Florence, and 13 miles south of Yachats. 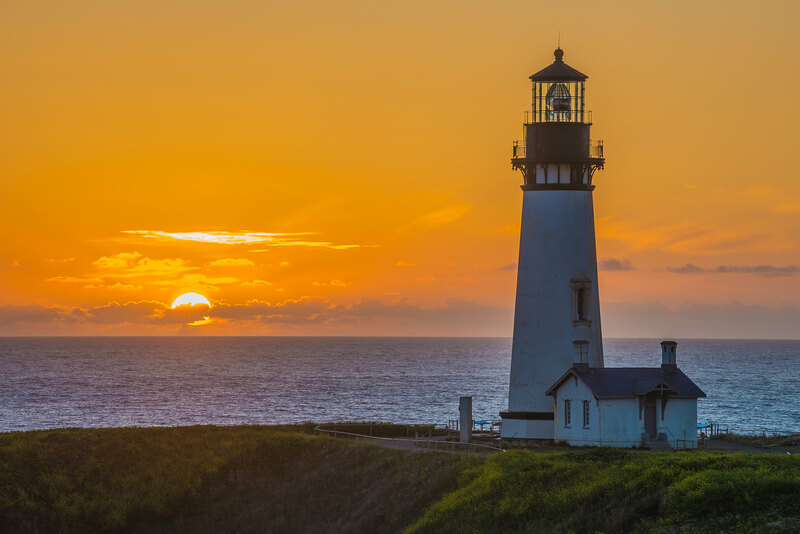 Built in 1894, the 56-foot tall it shines a beam visible for 21 nautical miles, making it the strongest light on the Oregon Coast. 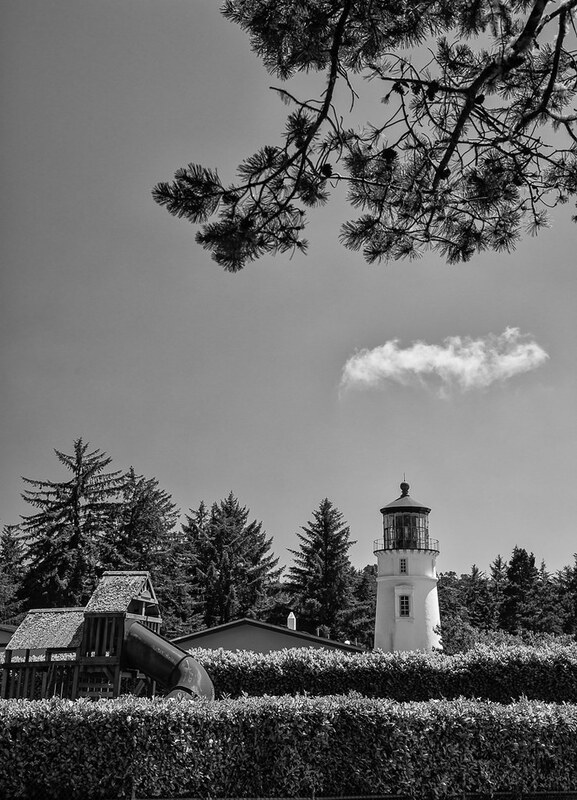 The lighthouse keeper’s residence is now a popular Bed & Breakfast place in Oregon. From the beach next to the parking lot you will have a good view of the residence. After shooting a few images of the B&B, I hiked up the lighthouse and looked around. 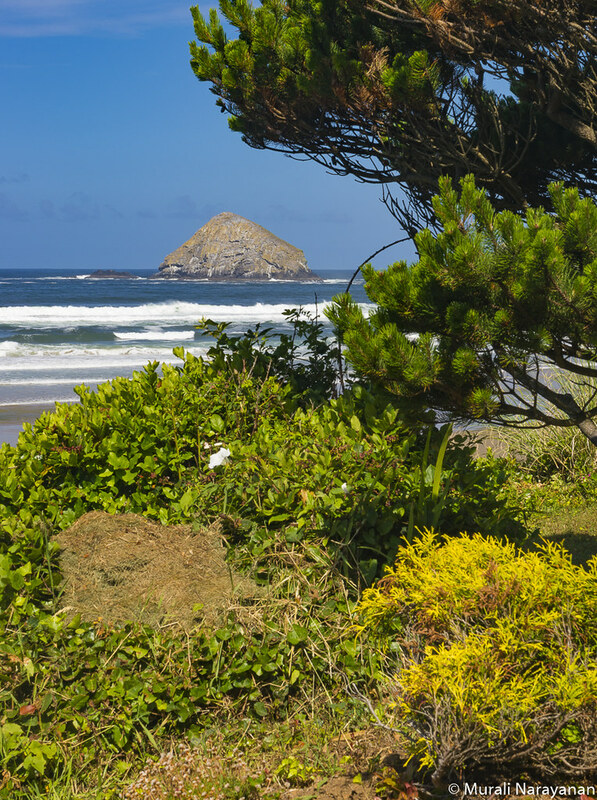 The best spot to shoot the lighthouse and the B&B is from a viewpoint one mile south on US 101 (Oregon Coast Highway). The view is spectacular. 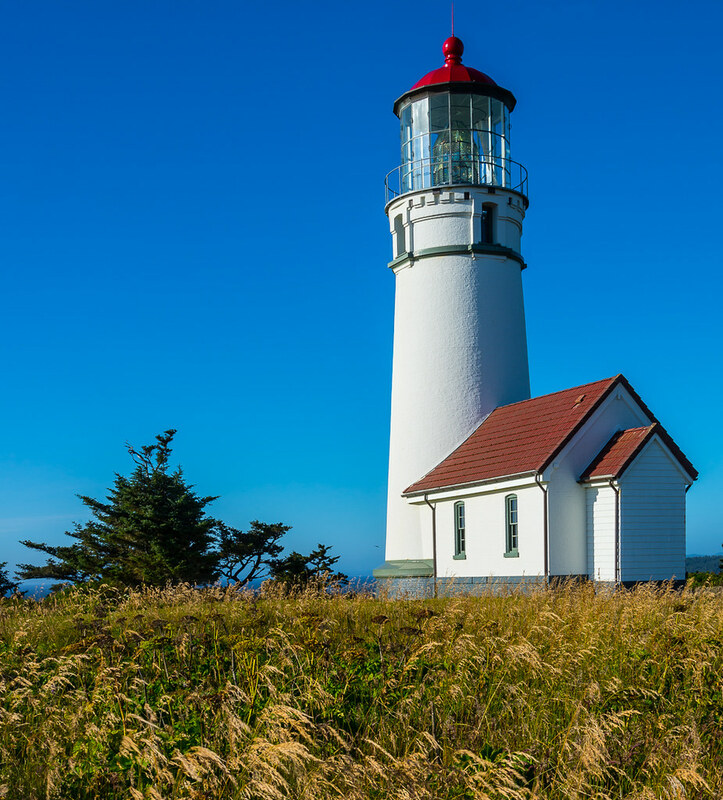 The light was getting harsh and I stopped at a few places to enjoy the scenery and got to the small and cute Umpqua River Lighthouse. The options to shoot the lighthouse are rather limited due to other buildings surrounding it. 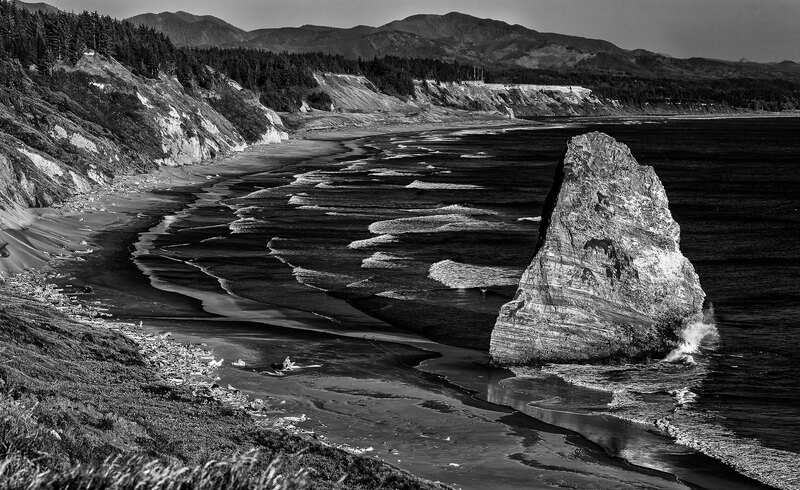 As the light was harsh in the early afternoon, I converted the image into B&W. I drove to Bandon and checked into a motel. 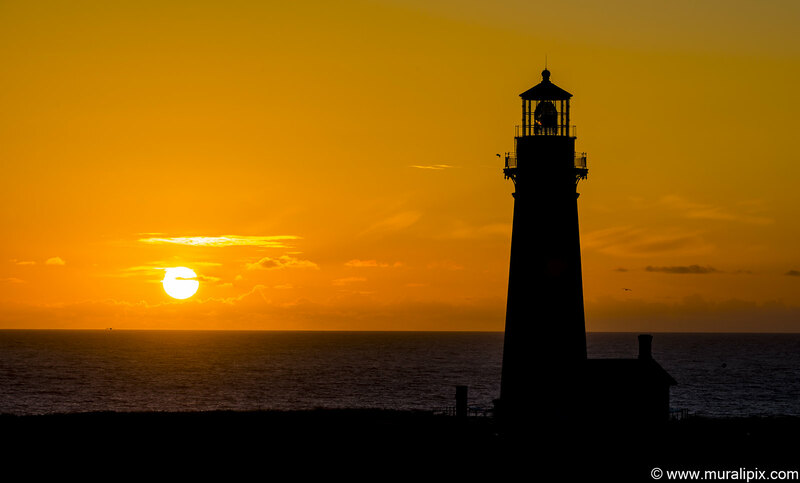 In the afternoon, I decided to drive down to Cape Blanco to shoot the lighthouse there. I was the only one at the park. The rugged coastline was majestic and the lighthouse was awesome as well. I felt that morning is a better time for more composition options. The hike to the lighthouse from the parking lot was also spectacular. 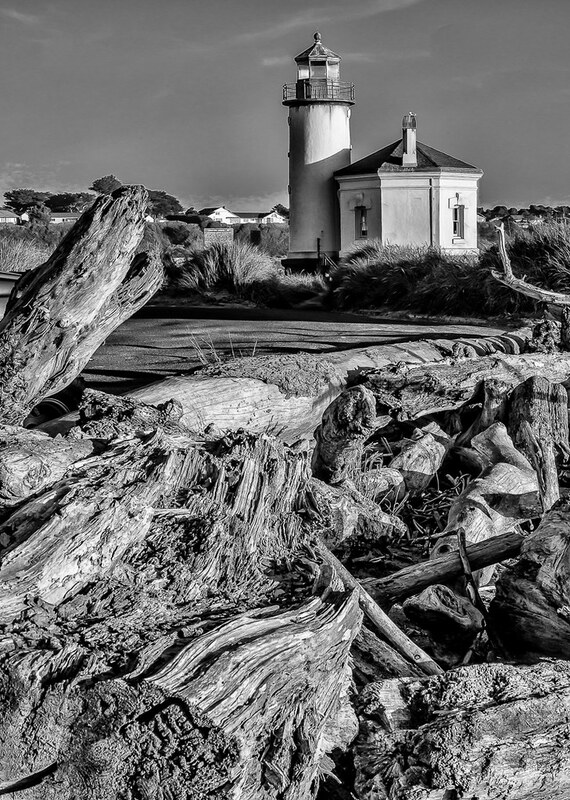 I returned to Bandon to photograph the Coquille River Lighthouse. It had been a very long day. I had a quick dinner and hit the sack. It was a foggy morning and visibility was limited. 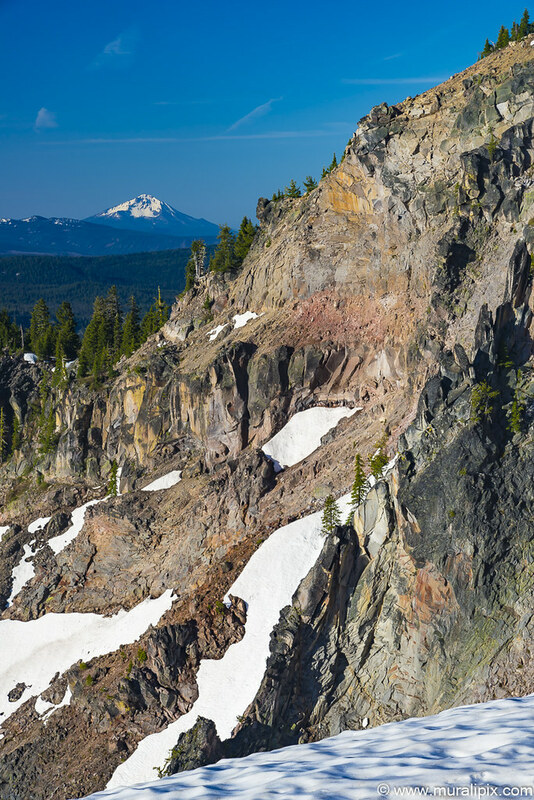 I headed to the Face Rock viewpoint and walked around until the fog dissipated, then shot a few images. Then I drove straight to Crater Lake and checked into the Union Creek Resort. Comfortable place near the lake. Two issues though – super slow & unreliable wi-fi (they use a satellite connection) and no cellphone service. They have a payphone outside the store at the entrance but be forewarned that it will set you back $10-20 for a domestic call. 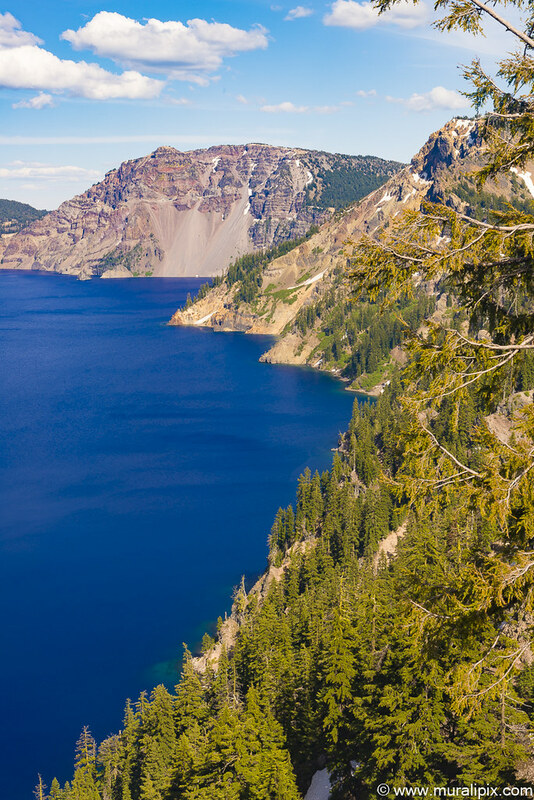 After lunch, I drove to the Crater Lake. 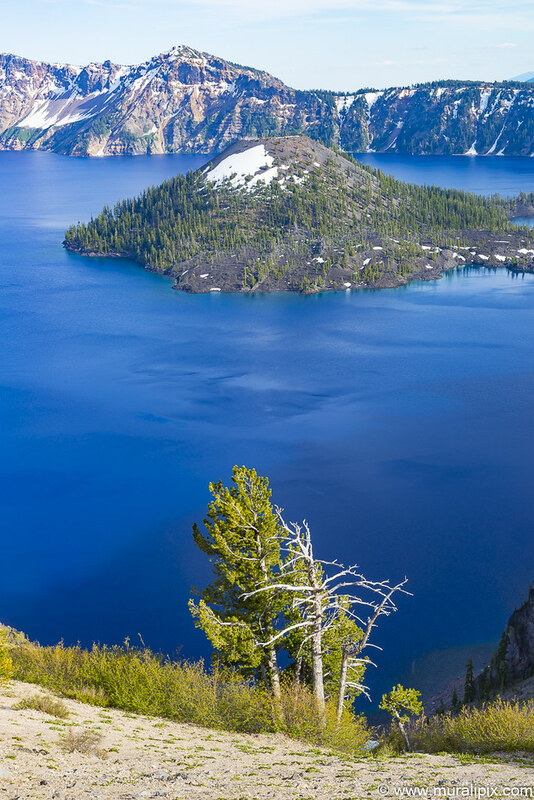 It is a caldera lake and is famous for its deep blue color and water clarity. 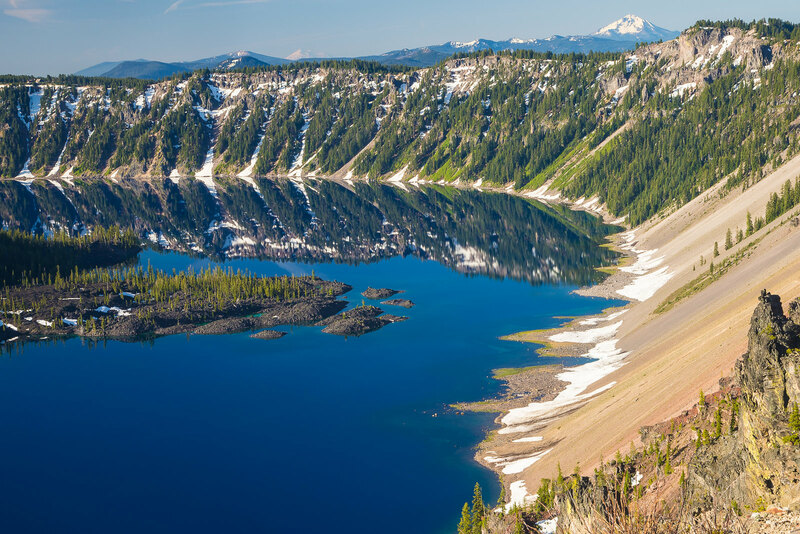 It partly fills a nearly 2,148-foot-deep caldera that was formed around 8,000 years ago by the collapse of the volcano Mount Mazama. There are no rivers flowing into or out of the lake; the evaporation is compensated for by rain and snowfall at a rate such that the total amount of water is replaced every 250 years. With a depth of 1,949 feet, it is the deepest in the United States. I parked the car at the visitor center and strolled along the rim. The views were spectacular and the water was dark blue and still. The west rim drive had opened two weeks earlier and I drove up to the trailhead to the Wizard Island boat dock, taking pictures from various viewpoints. I returned to the Union Creek Resort and called it a day. Today was the last day of the trip. 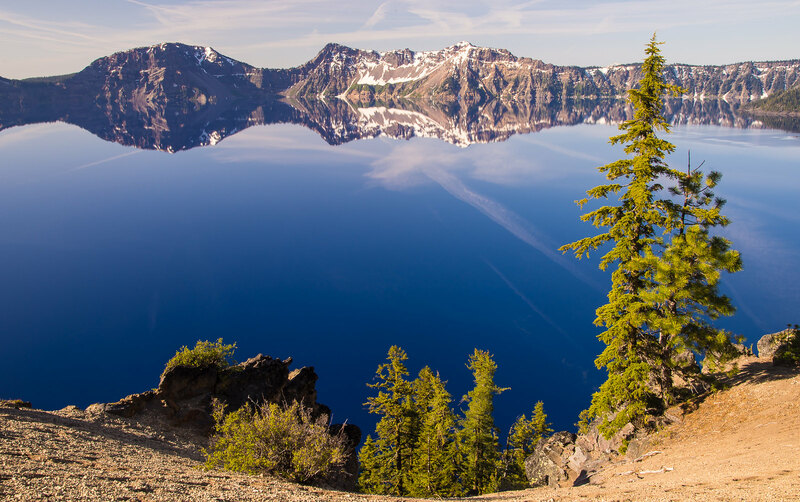 I got up early, had a quick breakfast and headed back to Crater Lake. As the East Rim Drive was still closed (it only opens sometime in July), I drove along the West RIM Drive and shot a few more images. By 930am the light was getting harsh and I decided to drive back home to Redmond, WA. 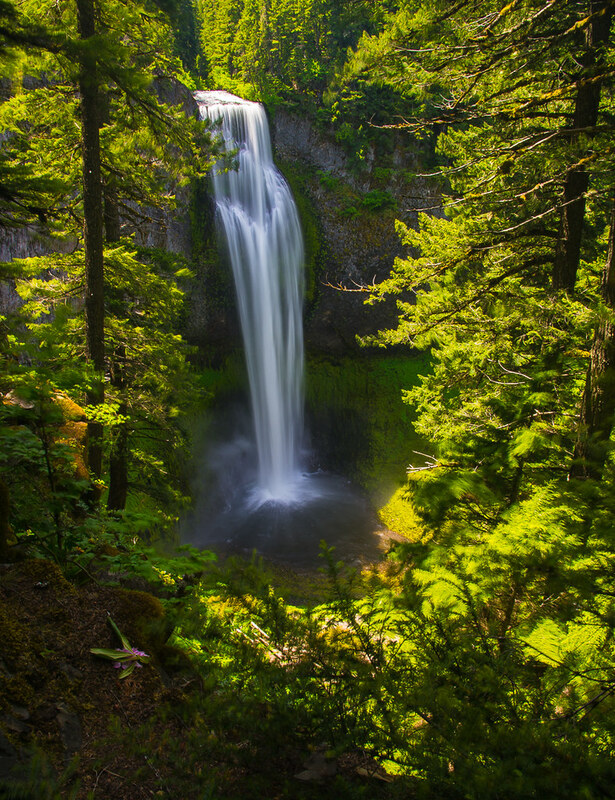 Along the way, I decided to check out two waterfalls, the Salt Creek Falls near Willamette Pass in the Willamette National Forest, near Oakridge and the South Falls in Silver Falls State Park near Silverton. It was past 11 when I arrived at the Salt Creek Falls trailhead. There were two other couples hiking to the falls. As it was not very cloudy, light was not optimal but I decided to checkout the falls anyway. When I reached the falls viewpoint, the top of the falls was well lit by sunlight but most of the falls was in the shade. I put on the polarizing filter to get rid of some reflections and stopped down the aperture to f22 to get a decent shutter speed of 0.6 sec. The trees around the falls were well lit as well. I ended up using the trees to frame the falls. 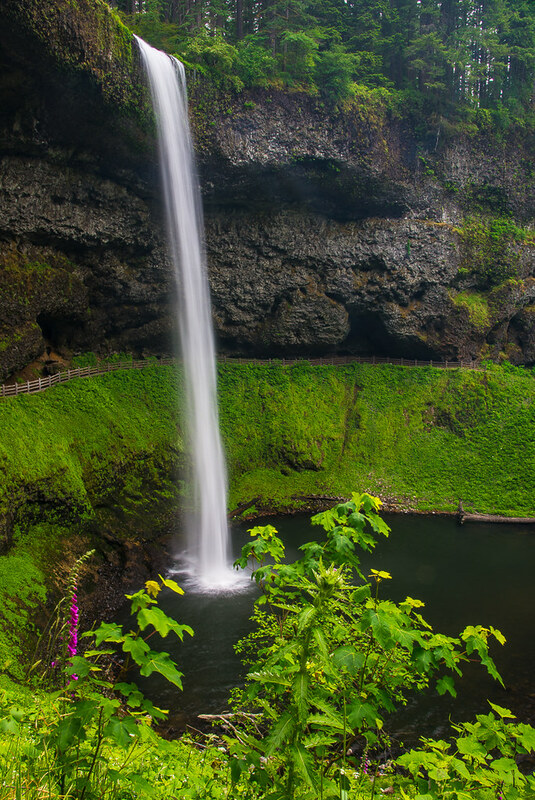 A cloudy day will be a better time to shoot this beautiful falls. I stopped for lunch in Eugene and drove to the Silver Falls State Park and reached it around 5pm. The South Falls hike was short but the trail was quite crowded. I found 2 terrific spots to capture the majestic falls, one just before the last set of switchbacks and the the other one just after crossing the bridge over Silver Creek. I left the park at around 6pm and drove straight back home.